Drs. Marjorie Brand and Jean-François Couture were awarded $588,000 from the Canadian Institutes of Health Research to investigate a new treatment approach for one of the most aggressive forms of childhood leukemia. The current treatment for T-cell Acute Lymphoblastic Leukemia (T-ALL) is chemotherapy, with side effects that include secondary cancers later in life and stunted growth. If the cancer returns after treatment, patients usually die soon after. 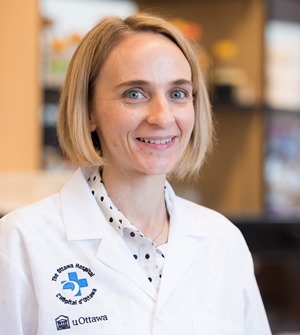 Dr. Brand’s research team previously reported that a common form of T-ALL called TAL-1 has a weak spot: It needs a partner in crime, an enzyme called UTX, to trigger the production of cancer cells. So when the team used a compound called GSK-J4 to turn off UTX, it completely stopped the growth of TAL-1 type cancer cells. This new funding will allow them to explore treatment methods for T-ALL that exploit this weakness, which may lead to therapies that are less toxic and more effective. Dr. Marjorie Brand’s research is possible because of generous support for Regenerative Medicine Research at The Ottawa Hospital.